← In the news: House for sale (in Paris!) & songwriter Cole Porter’s connection with the little song sparrow herself: Edith Piaf. 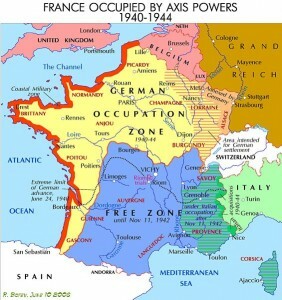 On 3 October 1940, the first of the anti-Jewish laws was enacted by the Vichy government, which held authority in the Free Zone—that part of France that was not occupied by the German or Italian military. The statute of 3 October excluded French Jews from public service—being teachers, etc. (Foreigners, Jews or otherwise, had been excluded since July). 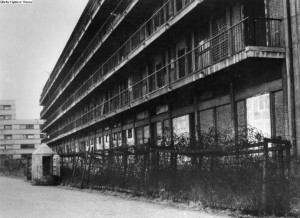 Following 3 October, large numbers of foreign Jews were interned in the French concentration camp at Drancy. Eventually, many would be shipped to Auschwitz and to various death camps in eastern Europe. Ironically, the proportion of Jewish survivors of the war was greater for France than for most countries that had been occupied by the Nazis. Perhaps this was due to a public backlash, later in the war, when many French people were appalled by the forced wearing of the yellow star, and by the mass arrests and scenes of screaming Jewish children been brutally separated from their parents in the street. Some senior clergy condemned the persecution from their pulpits, and some Christian families hid Jewish children and raised them as their own. Nonetheless, Julian Jackson (in his book France—The Dark Years 1940–1944) makes the point that the safest part of France for Jews was the south-west region that was occupied by the Italians. This entry was posted in World War II and tagged Auschwitz, Drancy, Free Zone, Occupied Zone, Vichy. Bookmark the permalink.